(Left) Kids performing at Rabindra Jayanti with Atlanta Sangeet Bidyaloy. 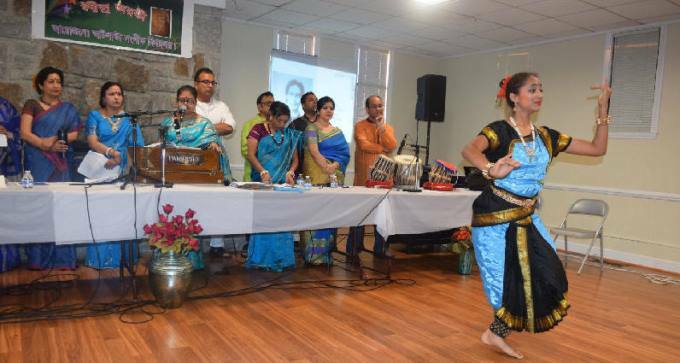 The music school Atlanta Sangeet Bidyaloy delivered a memorable evening of music, dance, and recitations commemorating Kabi Guru Rabindranath Tagore’s birthday on Sunday, May 22, 2016 at the Doraville Community Center. Tagore was a prolific writer who composed over a thousand works in poetry, novels, essays, short stories, travelogues, dramas, and songs. His writings transformed the Bengali language. He won the Nobel Prize in literature in 1913. Tagore was born on May 7, 1861. Every year, Bengalis all over the world celebrate Tagore’s birthday, also called Rabindra Jayanti, in the month of May with cultural programs encompassing his songs, dance, poetry, and plays. Chandra Dutta (at center, in green) with other artists singing with live music. 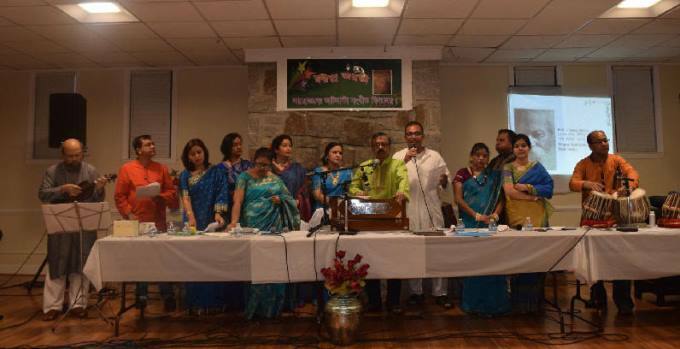 This year, Tagore’s 155th birthday was celebrated by Atlanta Sangeet Bidyaloy, a music school promoting Bengali vocal music: Rabindrasangeet, contemporary, and classical. The school was started around 4 years ago by Mr. Chandra Dutta, whose long career as a singer and teacher has spanned India, Bangladesh, Canada, and the USA. The school has celebrated Tagore’s birthday for the last three years with Bengali cultural programs. Students of all ages were directed in the program by Chandra Dutta, beginning around 7pm with a kid’s chorus song by Susmita, Gopika, Debesh, Gouranga, and Ananya. It was followed by solo and group songs by Chandra Sekhar Dutta, Kajori Mitra, Haimanti Mukhopadhyay, Manas Chatterjee, Debadrita Goswami, Shika Dhar, Subhadra Gupta, Dimple Majumder, Mitali Kar, Abul Hashem, and Ashoke Sarker. The show was enlivened with live instrumental music on violin by Amitava Sen, keyboard by Sandeep Savla, and tabla by Arup Dhar. Swati Dey wrote the script, and emcees Kakoli Dutta and Rizvan Hridoy kept the audience engaged. In addition, Rusha Majumder, Puspita Dhar, Ananya, and Gopika captivated the audience with graceful dances to Tagore’s tunes. Recitations of Tagore’s poems were rendered by Maruf Bhuiyan and Rizvan Hridoy. The program ended around 9pm, followed by dinner. A hundred or more people attended, filling the parking lot; children played as adults sat and enjoyed the program. Audience and participants sitting engrossed in the program. 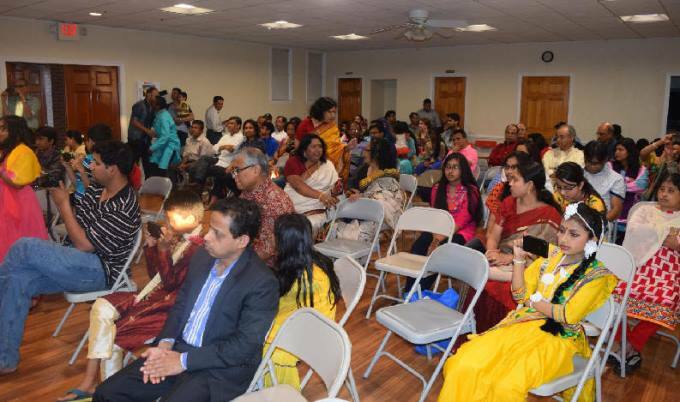 Rabindra Jayanti 2016_Hosted by Atlanta Sangeet Bidyaloy.